Ed Mangano and Tom Suozzi square off for the second time in 4 years. Election day is upon us once again, and though there are no Federal offices to decide this year, Long Islanders will still be assembling their local governments as they choose between candidates for both the Nassau and Suffolk legislatures, town councils and clerks, county and district judges, and (for the City of Glen Cove) there is even a mayoral race decide. One of Suffolk’s top positions on the ballot—that of district attorney—will not be impacted by the vote as incumbent Thomas Spota is running unopposed with the endorsement of the Democratic, Republican, Independence, and Conservative parties. 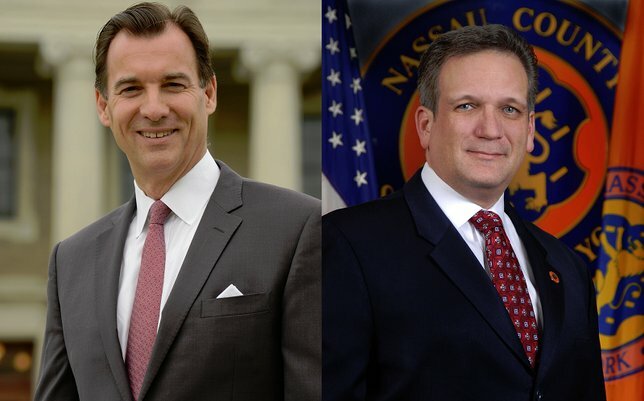 In Nassau, the office of County Executive is on the line as incumbent Edward Mangano seeks his second term, running against Thomas Suozzi, who previously held the office from 2002-2009 and was defeated by Mangano in the 2009 elections. Mangano—a Republican running with the endorsements of the Tax Revolt, Independence, and Conservative parties—points to economic development as a key issue for the coming years. He points to $290 million in spending cuts and the elimination of 1,776 county positions as evidence of fiscal responsibility, and notes that Nassau County has saved $4 million annually as he consolidated 10 departments down to 4. Mangano also says that his policies created 15,000 new jobs under his administration, and that he can continue to grow new employment opportunities through the building of a new sports arena in the center of the county and the redevelopment of the former Navy-Grumman property in Bethpage. He states that tireless work has already attracted homeland security, manufacturing, film industry, and other jobs to the area. Thomas Suozzi is a Democrat running with an endorsement from the Working Families party. He agrees that the economy will provide major hurdles over the next four years, and says that as county executive he stabilized Nassau’s finances during his two-term tenure. Suozzi says that attracting young residents to move back to Nassau will be key to the county’s future, and he intends to bring them in by revitalizing downtown areas. During a recent debate televised by CBS, Suozzi criticized Mangano’s consolidation of Nassau police precincts, stating that the move cost the county $61 million in overtime pay and reduced morale amongst officers. The former executive also recently accused the incumbent of failing to respond properly to the damage incurred by Superstorm Sandy. During the debate, however, Suozzi reneged slightly on those comments, admitting that Mangano had shown “empathy and sympathy” in Sandy’s wake. The opponents continued to campaign throughout the course of the day yesterday, trying to strum up as much support as possible in what could be yet another close election. In 2009, Mangano beat Suozzi by just 386 votes. Subject: LongIsland.com - Your Name sent you Article details of "Nassau Chooses Between Current and Prior County Executive as LI Takes to the Polls"